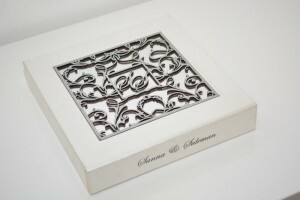 LATEST UPDATE: in August 2018 we have added a band new range of Laser Cut Designer Invitations for Hindu, Sikh, Muslim and Asian weddings. All our invitations are custom made and you can book an appointment to see the latest trend in wedding invitations at our office in South Woodford London E18. During August 2015 we have launched a brand new range of Hindu wedding cards, Sikh wedding invitations, Islamic cards and Muslim wedding cards. They cover all events such as sangeet, mehndi, wedding, ananad karaj, walima and reception. All of the contemporary new wedding invitations are totally bespoke and can be customised to suit your requirements and taste. Our design team in London E18 offer one to one consultations where we can design a, amazing and different wedding invitation for the biggest day of your like. Our invitations are unique and come with all matching stationary such as inserts, rsvp cards, mithai boxes, sweet boxes, favour boxes, place cards, table plans and much more. Please call is on 07763 21 20 30 to book a meeting if you like what you see on our website. The website is designed to give you a flavour of what we do together with pricing. All actual invitations will be customised and total bespoke to suit your requirements. We at cardwala.com specialise in custom made Indian Wedding Cards for the Elite Indian community in the UK. All Indian invitations are bespoke and can be made for Hindu Wedding Ceremony, Gujarati Knakotri, Sikh Anand Karj and Christian weddings. We can also make any of our Indian invitations without any religious symbols and use custom entwined initials and calligraphy. We have added an exciting new range of Indian Wedding Cards suitable for Hindu, Sikh, Muslim and Christian weddings. All of these invitations can be made without a religious symbol or with variety of religious symbols like Ganpati, Radha Krishna, Ek Onkar, Allah, Bismillah and Cross. All invitations are fully custom made. What you see on the website is an example of our recent creations. You are not restricted to these styles, you can customise all invitations to suit your taste and requirements. Most customisation is at no extra cost, unless elaborate new features are being added to the existing style. Our Indian Wedding Cards in UK are very different to the usual ready made Indian wedding cards available on the Internet from India. We specialise in high quality Indian Wedding Invitations for your elite event. We strongly believe that a custom made Indian Wedding Invitation sets the scene for the biggest day of your life and reflects your personality and taste. We will go to great length to ensure that your Indian Wedding Card is made to your requirements. Indian wedding is an important part in any Indian Asian’s life. We are fully aware of this fact and will make sure out Indian Wedding Invitation serts the scene for the biggest day in your like. We do no reply on ordinary ready made wedding invitation. We specialise in bespoke custom made India Wedding Cards for your exquisite event. 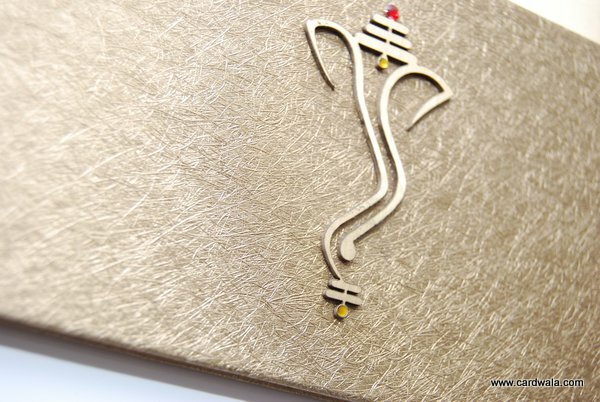 The unique point of our Indian wedding cards is they are custom made using the most exquisite materials you can imagine. 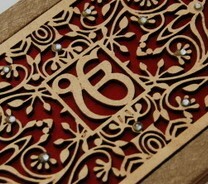 We create stunning scrolls, breathtaking custom laser cut, divine wood and produced to the highest possible standards. We are not the cheapest but offer the best value for money. An invitation sets the scene for your Indian wedding and usually one of the smallest expense of the Indian wedding but with the biggest impact. It a tangible part an Indian wedding and usually arrives weeks before to your lived ones and most will keep them for years to come. To give your Indian wedding the start it deserves please take a look at our Hindu wedding card, Sikh wedding card and Muslim wedding card section. But dont worry too much about religious symbols etc, they will be fully customised to suit your requirements. We have an impressive database of stunning high quality Indian wedding symbols including Ek Onkar, Ganpati, Ganesh and Bismillah. We also have ceremony celebration symbols for Wedding, Sangeet, Mehndi, Mandap Mahurat, Maglik Prsango, Civil Ceremony, Registry, Reception and Walima. The main difference between our range of Indian wedding invitations and other suppliers is that our invitations are custom made hardback invitations that are made to the highest standards for our Western clients. If your event is in a 5* hotel or another exqusite venue our invitations will set the scene for the things to come ! Dont be let down by a smelly, flimsy ready made inviation from India for the sake of £1-£2 per head. When you are spending £40+ on catering spending £2 – £3 per head on a stunning invitation is money well spent to set the scene. Indian Invitation is one of the only few tangible parts of an Indian wedding, so you may want to give it the attention it deserves. Unfortunatly a large proportion of our clients are those who have already sent weeeks and a large amount of money getting cards from so called “cheap” overseas suppliers only to realise that they are not right for their event. By the time you add all the hidden costs they are certainly not cheap and offer a very poor value for money. With us you will pay what you see and get what you see. Almost all our orders are taken in person at our studio in London so we can show you exactly what you want. Here at cardwala.com we specialise in unique and custom made Hindu Wedding Cards. We understand the importance of the wedding cards as they are the first impression your guests get of your Hindu Marriage. As everyone knows, first impressions count, so why give a first impression of your Hindu wedding with ready made, bulk produced wedding cards when you could show them these beautiful custom made wedding cards. As well as providing you with these elegant Hindu wedding cards we will also provide you with wedding stationery that will match your wedding invitation. This stationery includes favour boxes, table plans, table numbers, thank you cards, RSVP cards, place cards and Guest Books. When you have chosen your favourite design we can make any change you want – size, colour, font, pattern – anything! Just send us your chosen text and colours and we can make your cards. Before we start production we will send you a full colour proof so you can already visualise your finished card made just for you. With our thoughtful process we have many satisfied customers within the UK and Ireland. Our Hindu Wedding Cards are made with wood, silk and satin. Only the finest materials that are imported from all over the world. We have endless choices of scrolls, boxed invitations, laser-cut cards, folding cards and inviting books styled cards. Our designer Hindu wedding cards include inserts for The Arrival of Barat, Departure of Barat, Milni and Wedding. You can choose who gets all the inserts and who gets one or two. Each and every need of yours will be taken into consideration when your cards are being designed. You will be provided with everything you need, never anything less but always something more. You don’t get married everyday so why not take advantage of your big day and do everything you can to make your day the best one? We want to contribute to your Hindu Wedding and do our part, and do it well. You can also come and visit our Studio. Our studio is based in East London and we have all of the designs in the studio. Hundreds more designs than the website. We are open 7 days a week from 10am to 8pm by appointment only. Wedding Cards play an important part in Sikh and Punjabi Weddings so why have ready-made, bulk produced cards when you can have these Bespoke, Designer Sikh and Punjabi Invitations? With endless designs and colours we ensure you that your Sikh Wedding Invitations will fully satisfy you and your guests. To add to these Exquisite Punjabi Invitations we also provide matching favour boxes, RSVP cards, guest books, thank you cards, table plans, table numbers and place cards. Without including the Sikh and Punjabi weddings cards shown on Cardwala.com we have hundreds of new, bespoke and trendy wedding card designs for your Punjabi marriage. None of our wedding cards are ready made – they are all made to order, which means there are endless possibilities of what you can do with your wedding cards. If you can’t choose between two or three different bespoke designs we can create a brand new design just for you. We have a large variety of scrolls, inviting books, folding cards, laser cut cards and boxed invitations. All of our custom-made Sikh invitations are made from varieties of silk, satin, organza and laser-cut wood. Our Sikh and Punjabi Wedding Cards are made for all Sikh and Punjabi Wedding Events such as the Anand Karaj, Sangeet, Mehndhi, Wedding Ceremony and Reception. All events will be on matching inserts or fixed to the card like pages in a book. Some of your cards for distant friends may only have one insert for the reception whereas others may have five inserts for the Anand Karaj, Wedding Cermony, Mehndhi, Sangeet and Reception. If you want the WOW factor then this is the place for you, with our one-to-one appointments with you and your family at our studio, we can provide with exactly what you want – usually more, but never less. We promise you will be completely satisfied with out process ad if you have any questions about these exquisite and extravagant Sikh and Punjabi Wedding Cards just drop us an email and we will be happy to provide with the information you need. Wedding cards are the first impression your guests get of the wedding. If you guests receive tacky bulk-produced ready made cards the guests will not expect much of the wedding from the ready-made cards. Whereas if you give your guests these trendy, designer Sikh and Punjabi Wedding Cards, they know the wedding will be first class – just like the cards. We certainly don’t expect you to only rely on pictures of the Internet so come down to our unique studio. You can see all of our designs in East London where we have a studio with all of our Sikh and Punjabi wedding card designs. Our studio is based in East London and we are open from 10am till 8pm 7days a week. To fully appreciate the beauty of these Punjabi Wedding Invitations it is best to come down to the studio and have a look for yourself at the designer cards. O People, it is true that you have certain rights with regard to your women, but they also have rights over you. Remember that you have taken them as your wives only under Allah’s trust and with His permission. If they abide by your right then to them belongs the right to be fed and clothed in kindness. Do treat your women well and be kind to them for they are your partners and committed helpers. At Cardwala, we understand the importance of making your big day feel special. The wedding invitations are the first impressions your guests get of the wedding, so why have cheap bulk-produced cards, when you can have these beautiful bespoke custom-made wedding invitations? You don’t want your guests to think the rest of your wedding will be very cheap quality like the bulk produced cards. With Cardwala’s Designer Muslim cards your guests will be sure that your wedding will have the WOW factor – just like the elegant cards. As well as providing you with lavish invitation cards we can also provide you with matching save the date cards, engagement cards, table plans, table numbers, RSVP cards, Thank you cards and favour boxes in different sizes . All of your stationery will match the wedding invite in terms of colour, pattern and font too. That’s why Cardwala has hundreds of happy all throughout the UK, who are loyal and come to for their whole families events and functions. Whether you want a Bismillah on your card or even some Arabic quotes, we have it all. Even if your torn between two designs we can create a new one just for you. So that you know that your wedding invitations were completely unique and made just for you. If your someone who doesn’t like to rely on Internet images than don’t worry we have our own studio in East London where you can come down and see the cards in person. The studio in East London and is open 7 days a week from 10am till 8pm by appointment only. Once we have met or spoken by email or telephone and a design have be chosen we will send you a colour PDF proof of your card. The proof will include your text, your chosen colours, any patterns you wanted and any matching stationery you required. Then your cards will made in our factory and you can come and collect them and see your own personalised wedding invitation. We have a huge variety of scrolls, laser cut cards, wood engraved cards, folding cards and inviting book style cards. All of our Muslim cards are made from the finest silk, satin and wood as well as good quality card and paper. All stones are stuck on by hand and most cards are handmade. The laser cut cards are new this season and even your initials or names are laser cut into the folder of your Muslim wedding invitation. During October 2015 we have been busy designing brand new range of stunning Indian Wedding Cards. We have designed a new range of all types of Asian wedding cards for Sikh Weddings, Hindu Weddings and Muslim Weddings. They are totally bespoke and we start you of with a stunning concept that you can customise to your own taste and requirements. Our products are not cheap ready-made cards. Instead they are custom designed paying attention to every single detail from size, colour, materials, thickness, symbols, texture, fonts, typography and anything else to make sure you are 100% satisfied with the concept and design. Our aim is to set the scene for the biggest day of your life! Asian weddings are a big affair in the UK. A stunning Asian Wedding Invitation card sets the scene for an opulent Asian Wedding. 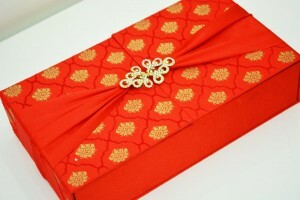 Our invitations are fully custom made and appropriate for the Elite Asian Weddings. An Asian wedding card depicts the class for rich Asian heritage. We fully appreciate the importance of an appropriate Asian wedding invitation and will got to great length to to ensure that your Asian Wedding Invitation sets the scene for the biggest day for your life. We don’t expect you to just rely on images on Internet. We offer a free one to one consultation at our studio in South Woodford London E18 UK. Here we have lots of stunning Asian Wedding Invitations suits for Indian Weddings. Our invitations are totally bespoke and made to your taste and requirements for your Asian Wedding. Our Indian Wedding cards are suitable for all Asian weddings including Hindu, Sikh, Muslim, Islamic and Gujarati weddings. A stunning Asian wedding invitation from Cardwala Xpressions is sure to set the scene for the biggest day of your life. Take a look at our stunning examples and book a meeting to discuss your Asain Wedding Cards. We are based in London and open 7 days a week to show you our Asian Indian Wedding Card range and discuss customisation accordingly. Our Asian wedding cards come in a variety of styles including scrolls, hard back book style, satin, laser cut and wood carved. All of the styles are fully custom made and personalised with your choice of colours, symbols, calligraphy etc. All Asian wedding cards are designed to create that WOW effect. They are certainly created to set the scene for your big Asian wedding event. Asians weddings in the UK have come a long from couple of decades ago. Our invitations are created for today’s weddings suitable for an exquisite affair in a 5* venue. Please take a look at our Hindu, Sikh and Muslim section for a taste of our work.